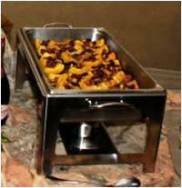 When setting up a buffet table for a large crowd, chafing dishes are the only way to go! Planning your next big get-together? Whether it's a birthday bash, church fundraiser or holiday gathering--chafing dishes are extremely convenient for both the host and guests. Chafing dishes allow a large number of guests to serve themselves while the host can mix and mingle without constant tending to food on the stove or in the oven. Even if you don't entertain frequently, purchasing or renting these dishes can't be beat. Chafing dishes, sometimes called steam pans, are simply large serving dishes in which food is kept hot or warm. There are different types of chafing dishes but all consist of a frame or wire rack, a water pan, a food pan and a cover. Water in the pan is used to conduct the heat which maintains the food at a proper serving temperature. The heat source is sterno or an electrical heating element placed underneath the water pan. They are perfect for an elegant or formal gathering and can range in price from $20 on up depending on craftsmanship. They are often used by professional caterers and restaurants and are available for rent at party rental stores or for purchase online or at restaurant and catering supply outlets. The most widely used type of chafing dish consists of a large aluminum water pan and one or two smaller aluminum food pans. It is relatively inexpensive and disposable. The water pan is placed on a wire or chrome rack and will hold one, two or three food pans depending on size. Disposable pans are usually used with a sterno heat source. These steam pans are available at party supply stores and department and discount stores and range in price from $5 on up. Water pans are sized to fit and the wire racks are usually full-sized. 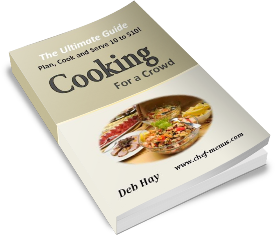 The first thing to remember is that chafing dishes cannot be used to bring foods up to serving temperature. Food must first be at the proper temperature before adding to the pan. Stainless steel and aluminum food pans can be used for cooking and/or heating the food in the oven or you can add food directly from another cooking pan or pot. The water pan is placed in the wire rack and filled with HOT water to a level that is close to but not touching the food pan. The sterno is then lit and placed under the water pan. The resulting steam will maintain the temperature of food that is already at serving temperature. The water pan should be checked periodically to make sure the water level is maintained and the food should be stirred occasionally to evenly distribute the heat and prevent scorching. Using a lid or cover will keep food moist. 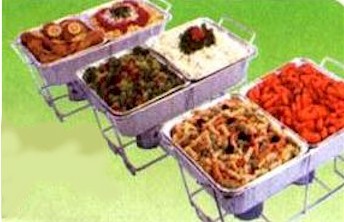 Chafing dishes will also keep cold foods cold. Fill the water pan with cold water and/or ice and of course, don't light the fuel! Sterno fuel is a formulation of denatured alcohol, water and gel and is perfectly safe when used as directed. It comes in small cans and is generally available from hardware stores and party supply stores. The sterno wick is lit and placed underneath the water pan. A full-sized water pan may require two sterno cans placed at opposite ends, particularly if the food is dense (such as pasta and cheese). The flame is blue in color and an 8-oz. can burns for about 2 to 2 1/2 hours. The fuel can be extinguished and re-lit. ◦Open the pan cover carefully, to avoid burns from the escaping steam. ◦Do not use anything but sterno-type fuel in the burner. dishes just before your guests arrive--leaving you free to mix and mingle. Yes, chafing dishes are a party hosts' dream come true.